Spiral mixer / Double cone mixer ( with 2 motors )(JTR Sreies) - Sinchung(Jachen) Technology Co., Ltd.
JT series Mixer Machines - Spiral Blender can mix all different material. The conical shape of both ends enables uniform mixing and easy discharge. The Double Cone Blender is an efficient and versatile machine for mixing dry powder and granules homogeneously.It can be used for Pharmaceutical, Food, Chemical and Cosmetic products etc. Rotary mixing guarantees intact strength. The upper inlet with a big diameter is used for material feeding and material is concentrated and removed at the lower outlet. 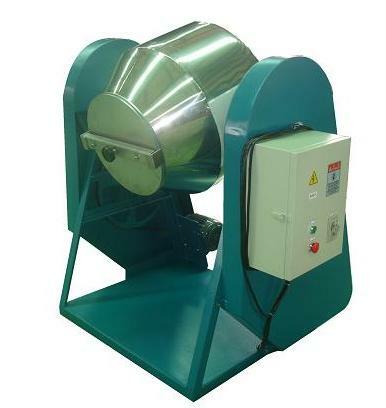 The mixing barrel can be tilted freely at the angle of degrees for discharging and cleaning purpose. The automatic stopping device can be set within the range of 0-60 minutes for automatic stopping. Blades (sus304) can be extra installed inside. Cleaning the machine is convenient and fast without adhesion. It is very suitable for GMP food and pharmaceutical factories. Suitable for even mixing of plastic powders, plastic pigments, foods, creams and pepper.